During my internship at the International Criminal Court – which has come to an end, so that I am now continuing my research on human rights and film at my home institution, the London School of Economics – I met a fellow human rights lawyer, from Chile. She noted that I had not reviewed any movies about the military dictatorship under General Augusto Pinochet. 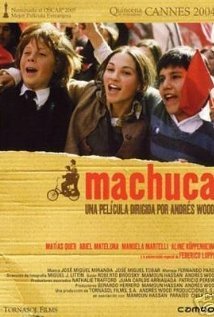 Today's review aims to rectify that, to some extent, by featuring the first (but not the last) such Chilean film – Machuca (2004). Set in the capital of Santiago, during the presidency of Salvador Allende, which lasted from his 1970 election till his death amid the coup on September 11, 1973, the film is a coming-of-age story of two boys in the run-up to the military coup d'etat. The film, directed by Andrés Wood, is semi-autobiographical and tells the story of a prestigious private school run by a priest, Father McEnroe (based on Father Gerard Whelan). Father McEnroe carries out a social experiment, inviting boys who live in local poverty-stricken areas to attend the elite, private school. Gonzalo Infante, a white, middle-class child bullied by his classmates, befriends one of the new boys, Pedro Machuca. Through his friendship with Pedro, Gonzalo attends and sells flags at the different demonstrations taking place throughout the city. At these marches, he is made aware for the first time of his privileged position: he witnesses his mother yell abuse at his new friends and at the actions of his sister's boyfriend. The movie, as one might imagine, has no happy ending. The military coup results in the repression of el pueblo, directly affecting Pedro's family. Gonzalo, however, can carry on with his life at the private school, saved by the colour of his skin and his Adidas trainers bought in Buenos Aires. Pedro has no such luck. With the army under orders to root out Communists and with absolute impunity to act with violence, the beginning of Pinochet's dictatorship begin to unfold. A dictatorship which resulted in torture, as indicted by Garzon and confirmed by the House of Lords in London. During the film, which is excellent and definitely worth watching, I couldn't help thinking how much my experience of the film must differ from those who have a close personal connection to Chile. As the director states above, the film is very detailed, with great attention paid to the clothes and setting of the movies (for example, the posters of Victor Jara, an artist/teacher/activist killed in the coup, on the walls of Machuca's house) in order to re-create the past. I wanted to ask my friend why she had recommended this movie in particular? Does it best represent the years leading up to Pinochet's coup? How does the director's partial vision of history fit in with her own? Did she recommend the film because cinematically it is good, or due to its popularity? When are things going to be done differently? A mixture of the profound with moments of touching comedy. I endorse the recommendation.